This week, I’ve had the luxury to experience the amazing Steam Convection Oven – NN-CS894S from the sponsor of SBA’15, Panasonic. Currently, I own a simple convection and a microwave oven which both take up quite a bit of space. Before I receive the new oven, I never knew that a microwave, convection & steam oven can actually be combined into one single equipment - saves space & energy! Such is the power of advanced technology and innovation by Panasonic. This amazing oven has over 7 functions inbuilt to cater to your needs. You can practically do anything from defrosting, proof and baking tosteaming, which is suitable for all kind of dishes, not to mention roast, grill, and many more! What's even more amazing is the combinations of microwavable functions with convection & steam, allowing for more even heat exposure and combined with the inverter technology, the Steam Convection Oven - NN-CS894S brings about more efficiencyand opens home-cooking up to aworld of possibilities. As you may have guessed from the title, I will be making the all time classic Singaporean hawker food 'Satay' with my own twist to it - WAGYU!Yes it's wagyu we're talking about and NO, it's not hard to find wagyu nowadays. It's easily available in many supermarketsand sometimes you can even find it on sale at a very reasonable price! Of course you can substitute wagyu with other kinds of meat, but the texture & taste will be different as compared to when you use WAGYU! 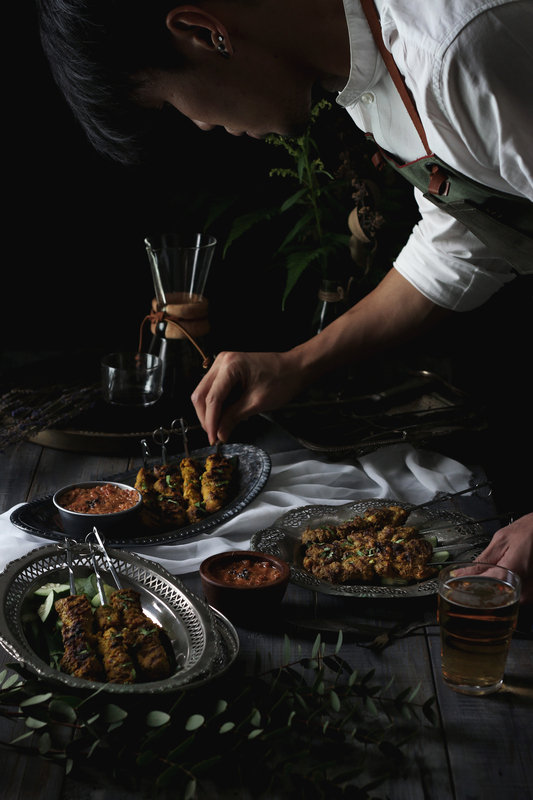 In this recipe, I try to distribute the fat and meat among the skewers equally. Do not worry about excess fats. Beef fat is one of the most flavorful oils you can ever have and with the use of the Panasonic Steam Convection Oven, it will be cooked more evenly, extracting out more fats than the normal oven, even more so with the 'healthy' function - suitable amount of steam release while grilling to remove excess oil. 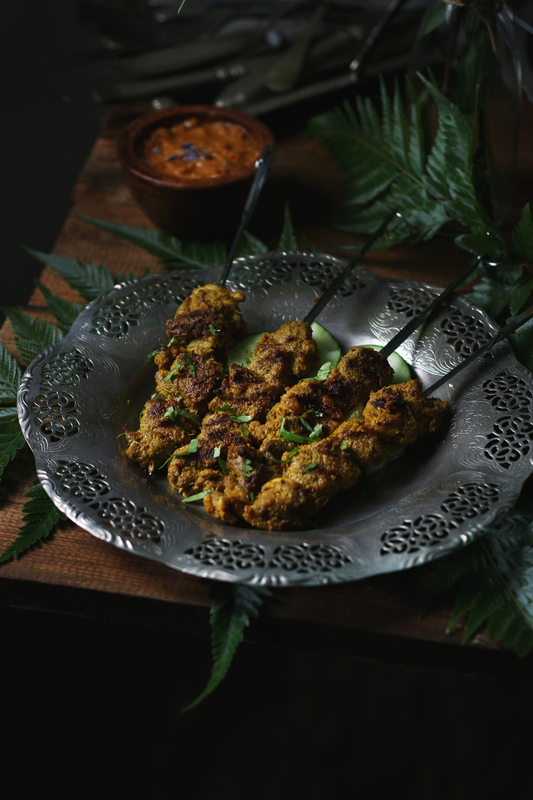 Have the satay cooked to just about done in 'healthy mode' and switch to 'Crispy Grill mode' to attain a beautiful, slightly charred finish. Furthermore you can also do the satay sauce in the microwave mode. If you do not have an oven, you can do it on a frying pan or a grill pan too. One advantage of using the Panasonic oven is that it doesn't splatter oil everywhere as compared to pan grilling and you get to enjoy a healthier and tastier dish too! This is indeed a highly recommended product! Note: Do use Microwave Safe wares if using a combination of microwave functions! Combine the blended spices along with the meat and give it a good massage. Make sure you rub all the spices evenly into every single piece of meat. Refrigerate for at least an hour or as recommended, overnight (will be the best) before grilling. Skewed about 4 to 5 pieces of meat in each stick. If you're using an oven, have it set at preheated 200C/400F. With a lightly crushed lemongrass stalk dabbed in oil, baste on both side of the meat and grill for a good 10-15 mins until fully cooked through - baste a few times throughout the grilling process. Then turn to boiler mode for about 5 mins to finish up with the char-grilled touch on the meat. If you're using a grill pan or frying pan, heat on medium high. Place your meat in the pan and baste the meat with oil using the lemongrass stalk. 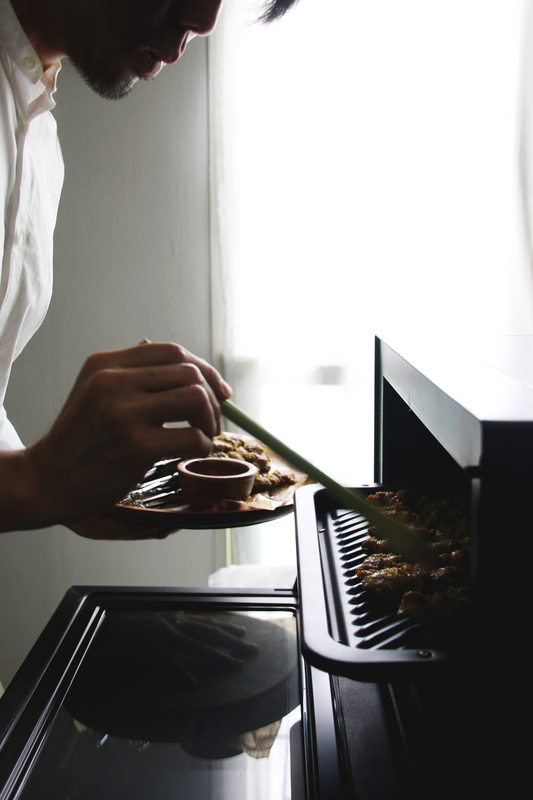 Every time you flip the satay, baste it again until meat is cooked and caramelized. Prepare the spice paste by pounding or blending soaked dried chilli, shallots, lemongrass, oil, garlic & galangal. After combining into a paste, fry in a pan until oil starts seeping out from the paste. Add in crushed peanuts and continue frying for a min or two. Add in assam water (tamarind), peanut butter, gula melaka & white sugar. Continue cooking on medium heat for a good 5-10 minutes. Taste and adjust for any seasonings accordingly. Once the sauce thickens, it's done! I served mine with fresh cucumber slices to lighten up the spice. You can also choose to serve this with Ketupat(if you know how to weave) or Nasi Impit (compressed rice cake) which you can easily make by pressing warm cooked rice (add more water when cooking rice) on a baking tray using a spatula/masher. Let it cool in the tray, cut and serve when needed. and you're DONE! Not forgetting the amazing craftsmen I've collaborated with, finickyinnature for the aprons, he do many custom tailor work, meichinn a very talented up and coming florist for helping me to gather the greens that I need. Do check their work out!